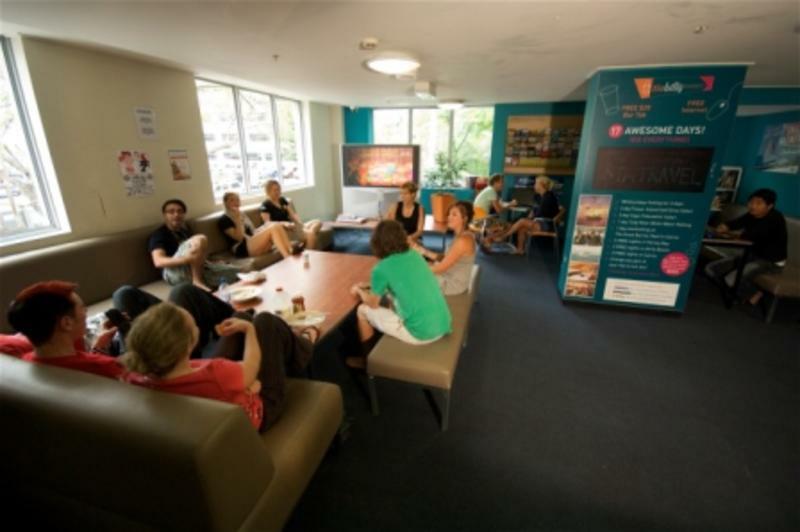 Directly opposite the Transit Centre (Greyhound and premier bus station) is Brisbane's hi-tech backpacker accommodation, Base Uptown. You can literally step off the train or bus, walk over a sky link to ditch your bags and then get straight into exploring the city! We offer all our guests free pasta and rice 7 days a week, anytime you like, free activities every day, so you will never be bored, and a $6 hot breakfast special - Buy on check in. Yum Yum! Internet wireless is also only $4 for 24 hours or $12 for one week! Monday - Movie night @ Base Embassy. Free popcorn! Tuesday - Walking tour of our beautiful city. Thursday - Football tournament in the Botanical gardens. Friday - Games night @ Base Central. Saturday - Guided morning running tour along the Brisbane river. Sunday - The Sunday Family BBQ! 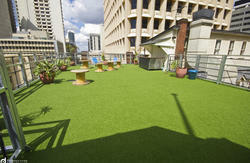 We are right on the edge of the massive 20 acre Roma Street Parklands. If they reckon that these are the lungs of the city, then you must be in the heart of it - and the guts of the CBD are right on your doorstep! The river is only a block away, which means it's easy to jump a ferry (after all Brisbane is known as The River City), or walk across to the other side. Nearby West End is a hangout for galleries, museums and other alternative lifestyles. You'll notice that safety and security are one of our big priorities - that's why we've installed a state-of-the-art fire safety system, as well as 24-hour guest access via security swipe cards into the building and all of the rooms. The five colour-coded floors have a fresh and vibrant decor, with an array of facilities that ensure relaxed home-style comfort. 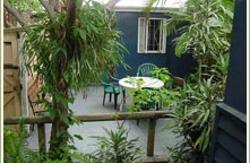 A fully equipped self-catering kitchen adjoins the recreation room, complete with comfy lounges, board games, cable television, and an adjacent coin-operated laundry for the domestically inclined. In-house we have a Broadband Internet Centre and a Job-Club employment service if you're looking for work in town or out in the countryside. Budget travelers can choose from a great range of dorms, twins, or king-size motel suites, all fully ensuited and air-conditioned. 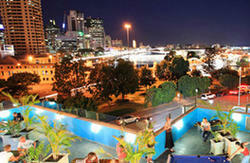 CENTRAL STATION: Take the Edward Street exit; follow Edward Street down the hill until you reach Elizabeth Street. Turn right and were two doors down on the right. ROMA STREET TRANSIT CENTRE: Cross over Roma Street from level 2 and head down George Street past the Treasury Casino before turning left onto Elizabeth Street. Were on the left-hand side past Albert Street and just after the Hilton. ARRIVING BY PLANE? Take the Airtrain and hop off @ Central Station.